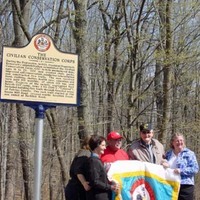 “Historic Marker: Civilian Conservation Corps (CCC),” braddockheritage.org/, accessed April 24, 2019, http://braddockheritage.org/items/show/226. 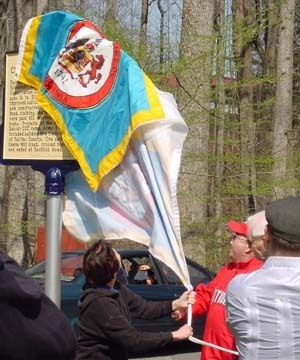 In the photo on the right, Fairfax County Board of Supervisors Chairman Gerald E. Connolly (center), Vice Chairman and Braddock District Supervisor Sharon Bulova, and Bill Sheads unveil the marker. In the second photo, Park Director Tawny Hammond (left, partially obscured) and Mary Lipsey join the group. 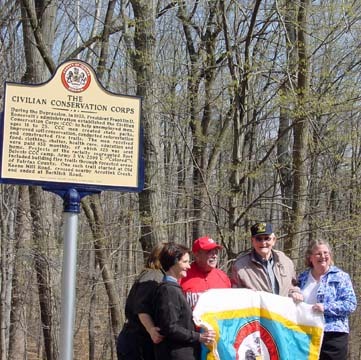 Bill Sheads' memory of a CCC-built fire road provided the seed for Mary Lipsey's research and effort within the Fairfax County History Commission to approve the historic marker. The marker stands beside the path of the former fire road, now entrance to the park headquarters building. It reads: "THE CIVILIAN CONSERVATION CORPS - During the Depression, in 1933, President Franklin D. Roosevelt's administration established the Civilian Conservation Corps (CCC) to help unemployed men, ages 18 to 25. CCC men created state parks, improved soil conservation, conducted reforestation and constructed fire trails. The men received food, clothing, shelter, health care, education and were paid $30 monthly, of which $25 was sent home. Projects of the racially segregated Fort Belvoir CCC camp, Army 3 VA-2399 C ("Colored"), included building fire trails through forested areas of Fairfax County. One such trail started at Old Keene Mill Road, crossed nearby Accotink Creek, and ended at Backlick Road. The Fairfax County History Commission, 2007"